You’ll see it is very easy and quick! Just beautiful, love the bright colours. I was thinking this would make a great gift for my niece who’ll be 4 in a few months time, how long was the chain you used for the poncho for your 5 year old if you can remember. My niece does not live near me so I can’t use her as a model. I’m sorry but I don’t understand patterns, I would greatly appreciate it if you could send me some written instructions on how to make this poncho. Hello! Lovely poncho! Thank yo for tutorial! on October 13, 2010 at 11:15 am | Reply Rachel D.
I love them (thank you for the tuto) and feel “crazy” enough to make one myself (don’t we all have a child’s inside each one of us ?). Big hugs and thank you for brightening up our days Angie ! Thanks so much for the poncho pattern – I was so hoping you would post the pattern. You are so good to your readers – your blog really brightens my day!! Thank you so much for the tutorial. My little one will love one of these. Your little ponchos are totally adorable! Such sweet, rainbow-ish colours! Hi! 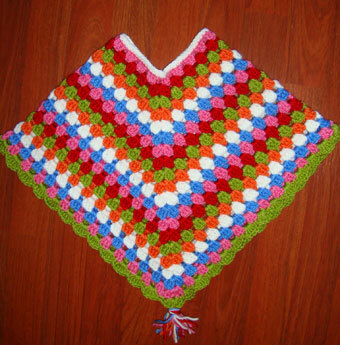 Thanks so much for posting this gorgeous poncho on my link party. Love the colours and I’m so happy you posted the pattern. Have a great weekend! What a lovely poncho! 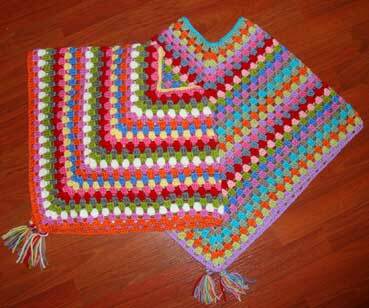 When I finished my cat-blanket and owl mobile (oh, i want to make so much), I would love to make such a poncho. Thankns for sharring the pattern. merci beaucoup, j’adore ce poncho, et je pense le faire à mes filles ! waouuuuuuuuu!!! merci pour ces belles photos! Merci! Thank you very much for this pattern. Can’t wait to begin! Could you be so kind to tell me where you order your yarn? Beautiful ponchos! Thank you so much for sharing the pattern, I guess there will be plenty of little (and big) ponchos soon everywhere. Hi! 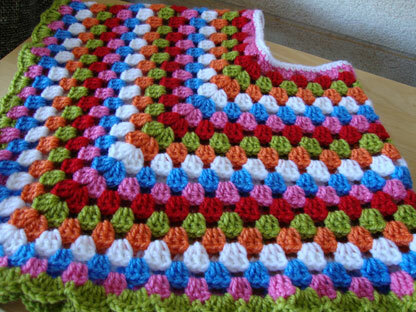 Thank you very much for this easy and lovely pattern! I had a blast making it for my daughter and she loves it! I posted about it on my blog today, do come and see. I didnt know how to make a poncho but was determined to make one for myself. My idea was to make big granny squares and join them. Working on it currently, hope it turns out right. But this poncho is great! Please tell me for adult sizes do we have to keep it as multiples of 8 or is there some other number. You have inspired me to make one for my daughter as well. I will make one for myself and post about it when I’ll have more time! 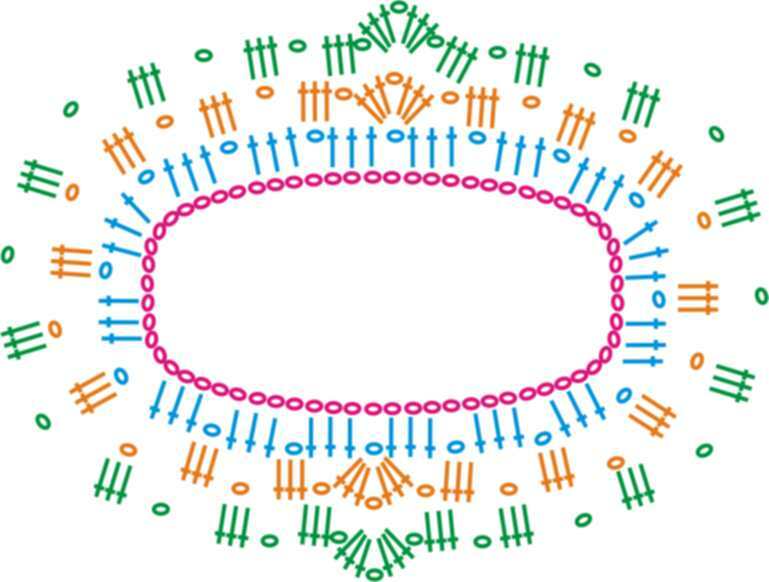 Hi Sucrette, I was wondering if it is one chain between each 3DC? Thanks a lot for sharing the pattern! Your blog is amazing. I adore the colors and playfulness of your designs. This is very inspiring. Thank you for being so talented and sharing with us. Please help with one questions: I am a beginner and about to knit the poncho for 2 girls (6 year olds. One lives in Tel Aviv and the other one in Budapest), they are my nieces. Anyone, please help…. Thank you so so much! Superbe, merci pour ce diagramme ! J’ai bien envie d’en faire un pour mon fils d’un an !! Thanks again for this lovely pattern! I just LovE it!! I´ve added a link for your beautiful blog! Thanks a lot! I loved ponchos. Thanks for the chart! I try it, you can see my version in my blog. I love this pattern. On the ponch oy ou made with the scallop border, how would I do that border? 🙂 Thank you! what wonderful colours you use, I too love colour. I am new to crochet after many years but becoming a grandmar inspired me to try again. I have started on your baby poncho for a one year old. I think my wool is a lot finer, DK, as I had to do 88 stitches!! I am using 4.5mm hook. It’s looking good and I am really enjoying it thanks to your blog. Can you give any tips on changing to a new colour. I can’t get it just right.? Also do you do 3chains when you move into the next round? Here’s hoping you have time to response. Kan je mij een gedacht geven hoeveel losse ik zou moeten nemen voor een poncho voor een meid van 7 jaar aub? Thanks for sharing your pattern/chart I chained 88 for my 7 year old daughters poncho. sorry, but I can’t read charts…. 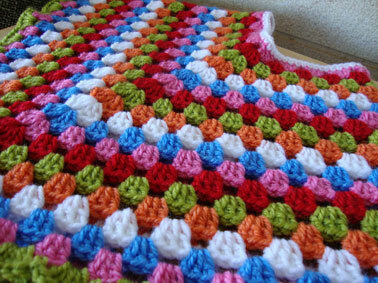 boo hoo……any row by row instructions for a crochet ignoramus????? Thank you for this pattern to make a crochet poncho 🙂 It is lovely. 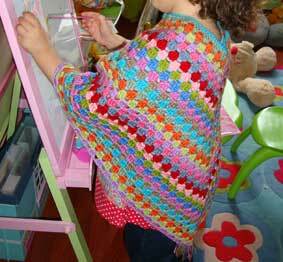 Love the poncho pattern, makes it so easy. I am making one for my son and for myself. Finally a pattern that is easy and looks very good and colerfull!!!! Started as soon as I saw it. Thnxx! Love this! I made it for my daughter last month – quick, easy and so much fun! Perfect for the weather in Tasmania, Australia. I want to make one for a toddler (18-24 mo.) – what size hook do I need and how much yarn? Also – what stitch do you finish with? HI… CUTE poncho. I want to make this for my next door neighbor… brand new baby girl. can you tell me what type of yarn you’ve used? Is it worsted weight or sport weight or baby yarn or ? OR…. is there a gauge… how many stitches equal how many inches? Can I please get the pattern for the child’s poncho? Hi, I just came across your adorable poncho pattern through a google search. I’m still a bit of a novice when it comes to crochet & do better following written instructions. Do you have a written pattern for your poncho? I would love to make one for my 2 year old niece who has two rare heart defects. thank you for sharing. Having the diagram helps. I kept messing mine up looking at other people’s patterns. a good chance that you should purchase pills that act as appetite suppressants. often have additional substances in them to help you reduce puffy eyes. 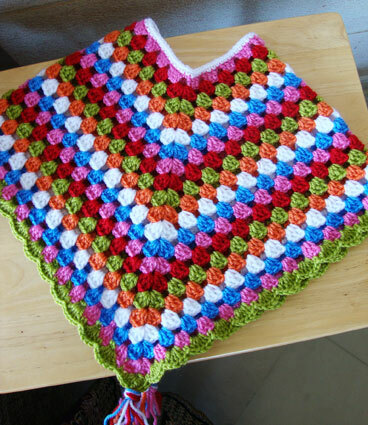 Hi i really loved ur poncho….want to make it for my daughter (4yr) old.i am a brginner and cannot read the pattern could u please explain how many chains should i make and how to proceed?…. I made this for my grand daughter, it was so easy. I chained 80 then joined, repeated for 20 rows, then I added some fringe on bottom and some flower buttons in front, I will be making one for me next. That last round on the little poncho. It is fancy. Where is the pattern or graph for that? I don’t see it. Hi, I’ve made two ponchos using your pattern. 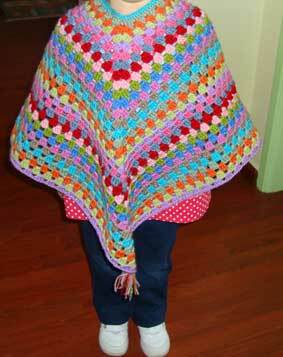 I am not new to crocheting , but when poncho is finished I am finding that the two points are not lining up. I have even blocked them and still find when the child is wearing it the points hang off center. Is there a step that corrects this? I am about to start another as my granddaughter has grown a smidge. hi, I don’t know what the symbols mean? where can I find this? just google it, translation of crochet symbols. 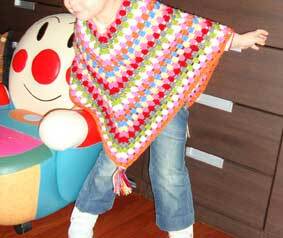 This Ponchos pattern is wonderful thanks a lot sharing it with us. Nice Ponchos pattern.It’s looks like so beautiful. I want to thank you for posting this poncho pattern. I made one for my granddaughter and she looks so adorable in it! I am making another one but want to ask you a question. After joining the chain do I crochet a chain 3 and then work 2 trebles in the next two chains? I know I need a chain 1 there to begin the next row. Though this are impressive patterns but it can be more impressive by using the multicolored combination and different designs. 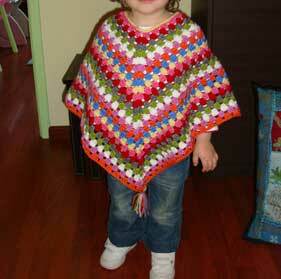 I´ve crocheted one more poncho based on your pretty pattern! Thanks a lot! Hoeveel heb ik nodig voor een baby poncho? Hi, I love the poncho! I would like to make one as a gift for a newborn baby… of how many chains should I make the first round? Thank you for sharing your work and the pattern. It is beautiful. I love the bright colours you chose. May I ask what yarn and size hook you used? You’ve inspired me to try my first poncho! on October 16, 2015 at 4:58 am | Reply Granny poncho voor de oudste | Bloggen, schrijven en bezig zijn… heerlijk! I need help reading the pattern. Is there a video or chart of what symbol means what. It is fun and easy! I made one for a doll of my grandchild. This piece was a liafeeckjt that saved me from drowning. Hello. In us terms is the pattern chain 1 and 3 double crochets? thank you. This was explained perfectly for me to understand, thank you for your time and effort to post this. I will try to make one for my 9 yo daughter! Hi my name is Victoria. I am interested in the easy Poncho for 6 Months. Very nice, what xarn did you use?